An 8 Foot Snap Frame has both pockets and poster holders. This Poster Display towers over the crowd! 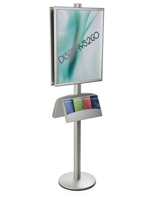 8 FEET TALL, this poster display makes your signs stand up... and stand out! 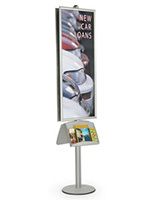 With two large, 24"w x 36"h back to back sign frames and literature holders, this poster display engages your customers. This poster display has a simple and elegant design. 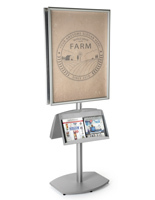 Built on a sturdy and durable aluminum frame, these advertising stands can be easily matched to a variety of floor plans. 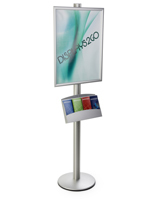 Great for large and crowded venues, these tall sign stands work well in convention rooms and lobbies! This poster display is also an ideal indoor advertising tool for trade shows, hotels, universities, shopping malls and large retail stores with high pedestrial traffic. 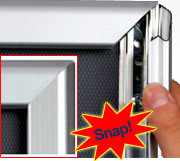 The poster frame uses a snap open frame design. 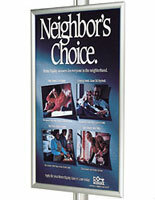 To change posters, simply snap open all four sign frame sides, position the print media beneath the clear, non-glare PVC plastic lens, and snap the frame sides shut. The metal literature holder is made from powder coated steel. This metal tray is solid and durable to hold brochures or magazines. 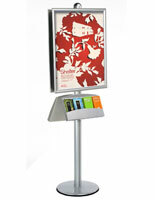 Both poster frames and metal trays have a connector plate behind them that run trough the pole groove. Poster frame and metal tray height are easily adjusted with the connector plate screws. 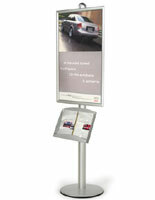 This poster display is affordable, innovative and versatile.